The Vahan is a rifle designed by Armenian inventor Vahan Minasyan. 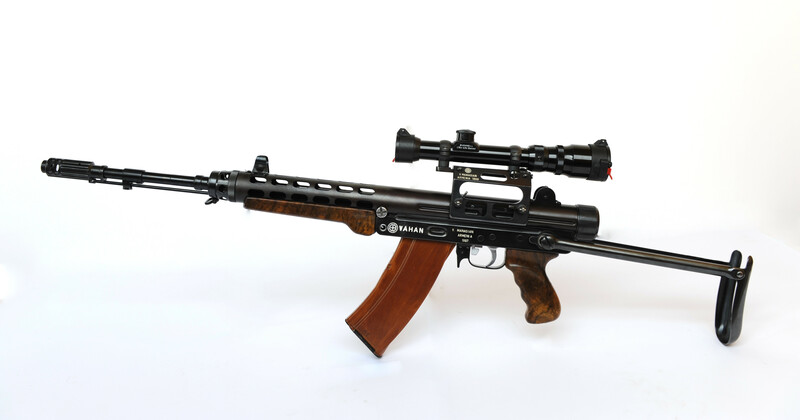 It uses a lever-delayed blowback mechanism similar to the San Cristobal or FAMAS, and is designed for the 5.45x39mm cartridge using standard AK74 magazines (although if you are an interested military or law enforcement organization, they will happily build you rifles in 5.56mm NATO if you prefer). 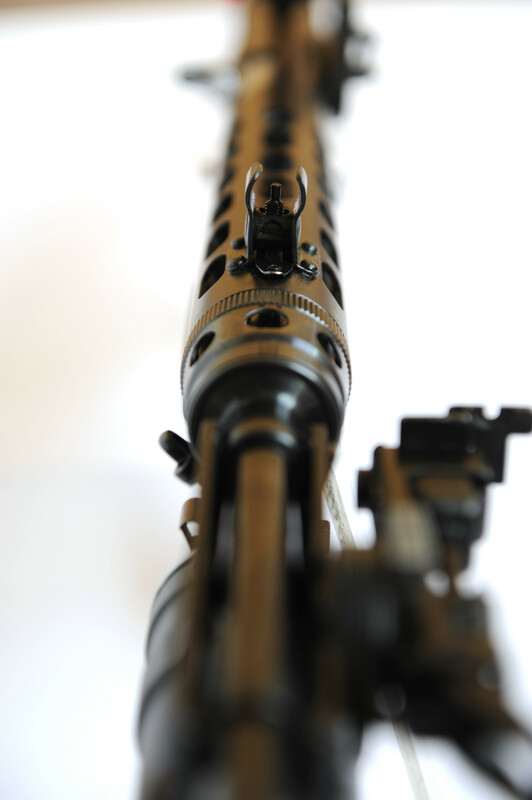 The rifle uses stamped upper and lower assemblies held together by a pin at the front and a button at the rear. Depressing the button allows the two main assemblies to separate so the bolt can be removed and the internal parts accessed. The safety is a lever located inside the trigger guard, which both blocks the firing mechanism and locks the bolt in the forward position when flipped down. The trigger mechanism is the type popular in some submachine guns, where a partial pull will fire single shots and a complete pull will fire full-auto. Sights consist of a two-position rear aperture and front post, both with decent protective wings. 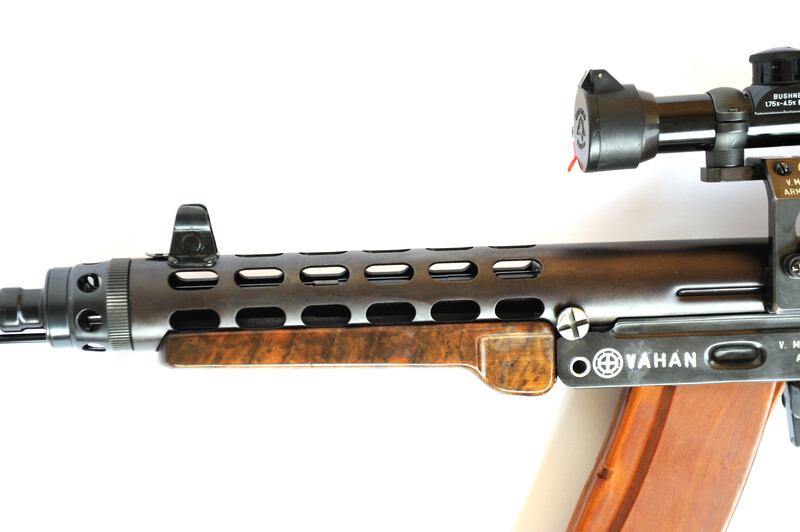 There is also a Russian-style scope rail fixed to the left side of the receiver to allow mounting of an optical sight. Thus far, apparently the rifle has failed to attract the interest of any major customers, and has not been put into production. I found it interested to listen to the marketing pitch presented in this YouTube video – the marketing hyperbole gets pretty deep. The spokesman (not sure what his affiliation with the inventor is) talks about it being much simpler than an AK because it doesn’t have a gas system, that is has an practical range of 1000m because of the optics, and that’s simply the best rifle ever designed. Seems to me that it has some pros and some cons. The lever-delayed system is a good one, with the understanding that it tends to be pretty sensitive to the specific pressure curve of the ammo it’s designed for. Change the bullet weight or powder type, and it may not work so well anymore (see: FAMAS). The position of the scope looks terrible, and the underfolding stock is one of the least-comfortable designs of folding stock ever devised. I’m not sure what I think about the semi/full mechanism – it means one less control on the gun to deal with, but I wonder how susceptible it is to shooting unintentional bursts when under stress. Thanks to our friend Hrachya for assembling the information and photos of the gun! He also sent us the Armenian patent for the rifle, which describes the details of it’s lever-delaying mechanism. For those of us who don’t read Armenian, Hrachya also graciously provided an English translation of the text. Thanks Hrachya! I’m not sure exactly how the “hook” setup compares to Kiraly’s two-piece bolt, but the principle of retarded blowback is roughly equivalent. It seems to me that by judicious angling of the engagement surface, this system cold accommodate some fairly strenuous cartridges, say in a GPMG. As it is, if it can handle 5.45 x 39 and 5.56 x 45, it should have no trouble with 7.62 x 39, 6.8 x 45, etc. Most importantly, any decent machine shop with the ability to produce stampings up to about the size of a car muffler casing (I know muffler shops that can do that) could produce this weapon. Note: the lever-delayed action works properly with pistol cartridges (example: Danuvia 39.M submachine-gun) or carbine round (San Cristobal) or assault rifle round (FAMAS), but when used with full-power round the rounds must be greased (see Schwarzlose machine gun [built-in oil-pump] and Pedersen rifle [cartridges factory waxed]). How is a highest power of cartridge which can be used in lever-delayed firearm without greasing? I agree that full-power rounds would be stretching the capabilities of such a system. I was just saying it could be done. I’ve often thought that the plastic-cased telescoped ammunition (PCTA)-type technology might make this possible. The plastic itself might act as the “lubricant”. And better still, it looks like a futuristic ray gun as envisaged in the 1960’s. You are welcome ! Thank you for posting! Always glad to support the community here in ForgottenWeapons! P.S. I am not sure who is the guy in the video, too. I tried to contact him … but haven’t received a reply yet. I can see that the rocking trigger hasn’t disappeared. A similar trigger was found on the MG-34, except that the MG-34 trigger was a double crescent (upper portion squeezed for semi-auto fire, lower portion squeezed for full-auto). I do agree that the Vahan’s scope looks terrible due to the vertical offset and that the delayed-blow-back system is a bit iffy. The folding stock is terrible for your cheeks. I think the rear sight seems to have come from a PPS-43 or a PPSh-41… any ideas? I suspect the trigger is closer to the (Au)Steyr AUG, being a “pull-through” rather than a “rocker”. Having dealt with both, I find the “rocker” less prone to operator-induced overrun under stress. I agree that the MP-38/40 style stock (standard on the old PPS, which was basically a Russian analogue of the Erma) is uncomfortable. But due to the PPS-like structure, there really isn’t any way to put any other sort of retracting/folding stock on it. A side folder would require a heavier pivot anchorage, with a separate welded-on piece mounted vertically; this setup allows the “ends” of the pivot to be stamped into the receiver sides, reducing machining needs and actually resulting in a stronger assembly when you’re done. The only other alternatives would be an MP-5 or M3 “Grease Gun” style retracting stock. Neither of which feels much better with a cheek weld than the MP-40/PPS type. Also, with them and the Uzi, the buttplate is always in the way of your proper address on the pistol grip when retracted. The PPS/MP-40 “underfolder” gets the whole stock out of the way, and if properly designed (as this one seems to be), the folded buttplate gives you a nice forearm “grip”, keeping your off hand away from the barrel jacket and the prospect of lightly grilled fingers. As for the rear sight, the rest of the platform looks like a PPS development, but the rear sight looks more like that of the Patchett/Sterling 9mm. I’d love to see a closeup to determining if it is in fact a flipover “L” with peeps and notches for different ranges. 100, 150, and 200 meters would be enough, consistent with the weapon’s mission and chamberings. From 200 to 400, use the scope; beyond 400, point the target out to the long rifleman or the GPMG team. Very interesting, especially in light of the prototype .308 Sterling using lever delay(I can’t get the photos of the sterling in the vault to display). I apologize about the photos – I had a blog plugin take a dive on me, and the galleries aren’t working now. I’m working on going through and replacing the images, but it’s a time-consuming process. The Sterling, does that lock through the side, through the gap in the “receivers” side, is the action on it’s side? Open bolt, forward, hook swings out, grips receiver back end of hook hits a firing pin, bolt moves back, unhooks, sort of a delayed action. I’m pretty sure they would be thrilled to accommodate a big civilian order too – but it’s generally only military and police organizations that can afford to place really big orders. Interesting… there have been a lot of expedient submachine guns that came out of garage workshops in Eastern Europe/ former USSR countries in the last 25 years but this is the first “full power” (if 5.45 counts) auto rifle I recall seeing. All seemed to be a mix of the innovative and quirky and none saw widespread production, which seems to be the likely fate of this. Pragmatically, one would think that there were enough Kalishnikovs east of the Danube that the need for something new would be moot. Same here about Ralph Peters. 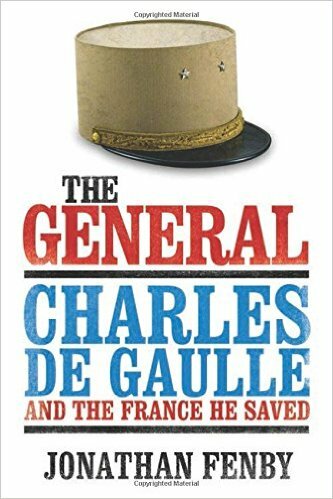 “Red Army” was probably his seminal achievement in the genre of military / socio-political / historical reality expressed in the form of a fictional novel that correctly and factually projected what might happen in the event of a real conventional war between the Warsaw Pact and NATO. The Azeris have lots and lots of oil. Interestingly, it is due to be brought west, and all of the bombs which got ditched into the Danube when they couldn’t be dropped on Belgrade (I have a friend who was living in Belgrade at the time of the Nato bombing – her sister was so terrified by the bombing that she ended up taking her own life rather than endure more nights of air raids), now have to be found and de-fused, prior to the Danube being dredged for the oil barges. I knew there was lots of oil in the region, but from what I have seen there are a ton of infrastructure problems. (Mostly outdated Soviet refineries and pipelines, with too much instability for outside investment.) The ditched bombs are an angle I hadn’t heard about… thanks, that is interesting. The Armenian-Azeri war was such a classic example of ancient bloody-minded tribalism. One interesting little factoid I ran across was that the Iranians provided quite a bit of support to the Armenians, who are famously Christian going back to Gregory the Illuminator, against the Azeris, who like the Iranians are S’hia. However, the Persian majority in Iran has longstanding tensions with their own Azeri minority so the mullahs opted to cross the religious line rather to discourage Azeri nationalism. Incidentally, speaking of ditched bombs, in the “The Devil’s Garden” novel mentioned above (which is about a maverick Army Intelligence officer – which pretty well sums up Peters’ career, according to his autobiography – searching for the kidnapped aid-worker daughter of a US Senator) at the end the protagonist has retired from the Army. And winds up as an aid worker in Laos on the Plain of Jars, which is badly contaminated with jettisoned ordinance dropped by US airplanes returning to Thailand from North Vietnam and which are still going off with depressing regularity and devastating consequences. It’s interesting that you mention links between the Armenians and Iran. Under the Ottomans, a significant number of Armenians were sent to / dumped in / exiled to, and remain to this day in what is present day Iran, where they suffer at least equal state depredations as the majority population. Jim, I left a reply to your comment about .351 in a revolver. Saw that! Thanks… guess I just have an old-fashioned attitude that in a handgun there is definitely such a thing as too much power; since 99% of the rounds I put through my Super Blackhawk were Specials, not magnums and this is true of the .357s I’ve owned I never paid that much attention to the Maximum. The thought of a .351 N-frame is just one of those oddities would-have-been-neat-if that had been rolling around in my head for years, in the same region as my desire for a 1911 in 7.62 x 25. Not knowing where the revolver thread is, I’ll leave my two cents’ worth here. My problem with .351 WSL in a revolver is that semirim. The .45 Colt has problems in the New Service due to its relatively small rim; I remember one NS .45 LC I had tended to have a round slip under the extractor star if the pistol was held level or muzzle-down when clearing it. The Peacemaker never had this problem because the rim was big enough to headspace from (in addition to the case mouth in some models and calibers) and the ejector rod took care of positive removal of the empties. This makes me think that like its descendant, the .30 Carbine round, the best platform for the .351 in a revolver would be a big-frame Peacemaker. The Ruger Super Blackhawk would be a nearly ideal choice, in fact. The reliability of extraction with such a long semi rim case (without half moon or full moon clips) is an excellent point. Barnes gives the rim diameter of .351 as .410″ compared to .440″ for .38 Spcl / .357 mag / .357 Max, headsize ahead of the rim is so close between the .351 and the .357 family as to be identical (.381″ for 351 and .379″ for .357). I was thinking of something similar to that hook, for the SA80, but back to front and upside down. Reinforce two sections of the upper receiver with two plates welded on the outside drill straight through both sides to fit another pin i.e. The upper/lower retaining pin, but this would catch the hook. 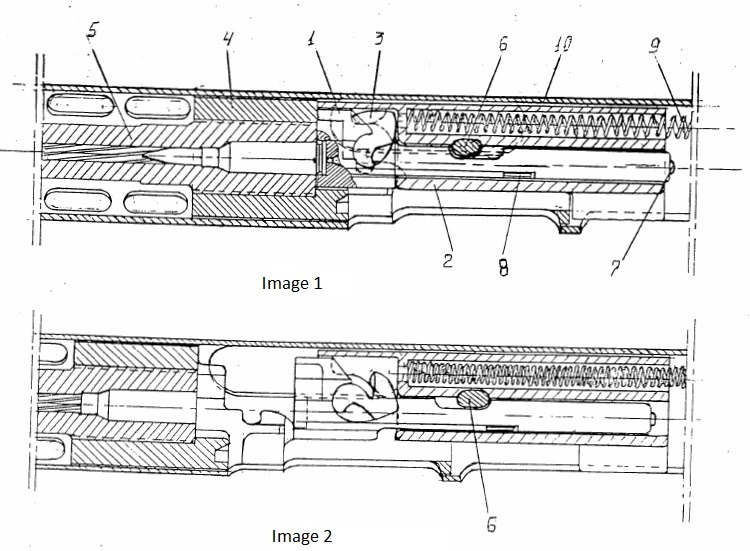 Then it would be uncaught by the gas tappet rod engaging the bolt carrier, would the hooks at either end would run through allowing the hooks to fold back and pass the pin. Anyway what a nice rifle the Vahan is. Just a note on the stock… I remember display ads in gun magazines when I was a kid (early 70s) for an aftermarket M1 carbine folding stock that was patterned on the MP-40. Wooden forestock and pistol grip with a metal fold-under… looked neat in the ads. I’ve shot a couple of M1A1s but I’ve never seen one of these although they must have sold quite a few of them because the ads ran for years. Anyone ever run into one? How well did it work? I’ve shot the M1A1 with the G.I. folding stock; it’s pretty sturdy and stable, and feels a lot like firing the Karl Gustaf M45 “Swedish K” or Danish Madsen M50 SMGs, with their tubular “rectangle” folding stocks. The only things I’ve shot with the MP-40 type stock were Chinese Type 56-2 AK copies (selective-fire with the folding bayonet, too), and original MP-40s. I still have a little “line” on one cheek courtesy of a rough-finished Type 56 “folder”. The MP-40s were a bit better finished until relatively late in production (after early ’44). I had a variation on one of those under folding stocks for a Mini 14. It was made of a heavy, thick, hard, black polymer that reminded me more than anything else of Bakelite. The steel underfolder had a number of functional issues The chief being that the locking mechanism left a lot to be desired. The arms were attached to either side of a horizontal steel pivot-point cylinder perpendicular to the bore axis that ran through the stock behind the rear of the receiver. at the very rear of the stock was a spring loaded plunger that actuated the stock. To un-fold the stock, you pulled the plunger back, disengaging it from a hole through the pivot cylinder parallel to the bore axis, allowing the pivot to rotate backward. When the stock reached it’s extended position the plunger would snap back into the other side of the hole through the pivot cylinder, “locking” it in place. The problem was, it didn’t “lock” securely. You had to push the plunger forward to tighten the lock-up of the stock and minimize up-down stock wobble. After firing a few rounds, the plunger would again work its way backwards, and you’d have over 1/2″ up and down plat in the stock. The spring was stiff, but the plunger design was simply faulty. Adding this to the fact that a steel bar makes for a lousy cheek weld, and the fact that the brittle plastic around the pivot area seemed like it would have split had you dropped the rifle, and the stock basically was nothing more than an attractive and exotic, but functionally near-useless, curiosity. I never was able to ascertain the manufacturer, as the stock was unmarked and I had lost my old 70’s-80’s SGN’s. I am not even sure it was a production piece, it could have been a prototype, however it had a cat-tounge plastic fleck finish that seems awful refined for a prototype. Jim, I want to say the M1 carbine wood underfolder you mention was either made by Feather, or sourced overseas by SARCO, but I cannot say for sure. I believe it had a different style locking mechanism than my Mini 14 wonderturd stock, Hopefully someone will remember something about both these stocks and enlighten us further. Variety is good, however it generally sells poorly or not at all. So as much as this rifle might be interesting, it probably meets the same fate. It is commandable though that Armenians try and this may boost their sense of pride. Luckily for them they have decent backing in Russia, just in case. Company called Czech Weapons (not to confuse with CZ) – incidentally owned by Russian national, has an extensive palette of models based on similar principle actually derived from older Baryshnikov’s design. Baryshnikov had worked in past with firm known as LZC which was one of the attempts thru the last 20 years. The CW is as I believe based on one time CZs R&D facility. There was a man who’s name was ing.Findorak who was originator of current CW design concept. In spite of all the proclamations of proves, no sales. Yeah, this is bad market to be in. This is intended to demonstrate bigger picture. Definitely Forgotten Weapons. Sorry inventors, it’s not very rosy, but such is reality. Thanks, Denny — great lead! What a pity about the bad “market timing” ( as has happened too often in the history of firearms ), but it is still heartening to know that there are inventors who won’t give up and still keep on trying in spite of the odds. When you look at private and unsolicited initiative, you have to start with clear conception to propose a solution better or unique in some way which would fit into ‘hypothetical’ customer need (they are at different wavelength since there was not prior communication). This is obviously lot harder to meet with success, even remotely. And yes, I tried that too. See, second miss! I should know better given my background in years of study of Russian language. Thanks! You’ve got to hand it to Vahan Minasyan and company. 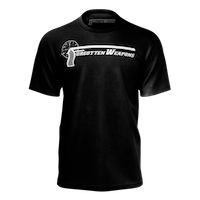 They are trying hard in spite of the odds stacked against them in today’s firearms market ( which they must be all too aware of ), and I am sure they don’t exactly have huge amounts of sponsorship from well-heeled investors either. If the rifle and its descendants turn out to be solid, reliable performers, I sincerely hope that they will succeed in their endeavours. It’s a pretty decent product for a first-time serious attempt that probably has potential, never mind the advertising blurb. I’ll vouch for that — works all ways, too :)! lever-delayed blowback assault rifles were tested by Soviet army on numerous occasions, and despite their merits (simplicity, low cost, reduced felt recoil) these were found generally less reliable than gas operated actions, especially when considering variety of loadings, case materials and coatings, and performance under harsh conditions. Was that the case with the TKB-517 in reliability versus the AKM? Classic story of country initialy (in war) very much deprived of weapons (Armenia) that resorted to domestic R&D and prouduction. Economically, Azerbaijan potentially has the upper arm, due to the recent oil production and bigger defense spending.